How Tall Of A Mug Will Fit Under A Keurig Mini B31, K10, or K15? Do you plan on getting a Keurig Mini sometime soon? It wouldn’t be fun to buy a mug that wouldn’t fit under it. I know which mugs are best for the Keurig mini so let me share them with you. A mug needs to be less than 5-inches high to fit under the machine and the mug should be 4 inches high to fit without removing the drip tray. This is actually an important thing to note because if you are anything like me you wont want to remove the drip tray. If you remove it you have to store it somewhere and that just feels like clutter. Although the Keurig Mini can accommodate five inch tall mugs it’s best to plan on using mugs that are four inches high or less to keep your machine in it’s easier-to-use state. Most basic coffee cup will fit just fine but if you want to use any kind of an insulated mug then you really have to shop around for the perfect one because even with lids off the smallest insulated mugs tend to be taller than four inches. 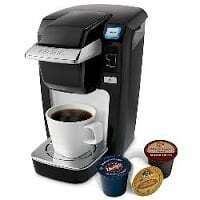 I’ve already posted a few times already on this blog about various kinds of mugs that fit under the Keurig coffee makers and most recently I posted on the top 3 mugs for the Keurig Mini so I suggest looking at those posts for reviews of your smallest options. Today however I just wanted to simply answer the question on everybody’s mind in more detail. How Tall of a Mug can you use With a Keurig Mini Coffee Maker? The Keurig Mini B31 model was replaced with the K10 and in late 2016 the K15 started phasing out the K10. All three of these units however them have the same dimensions. The most modern versions: the Keurig K-Mini and K-Mini Plus are both actually a little larger. You can fit a 6 inch mug under those without fiddling with drip trays so I think that’s a pretty nice upgrade. With the drip tray removed on the older versions of the mini brewers you have 5 inches of clearance to insert a coffee cup or an insulated mug. If you want to keep the drip tray in place then you need a mug that is less than 4 inches tall, which is awfully small. In fact most of the normal coffee cups in my cabinet are between 3 and 4 inches tall with some over-sized mug’s that approach 5 inches. Will Insulated Mugs Fit Under The Keurig K15 & K10? As for insulated mugs only my desk mugs come close. The Tudeau Umbria which I reviewed here stands just over 5 inches tall making it too tall for the older Mini brewers although they would fit under the new K-Mini coffee makers. One alternative to the Umbria is The Patterson wide base travel mug which stands 5 inches tall exactly, meaning it should fit just barely under the Keurig mini when the drip tray is not in place. I posted this video on the topic of travel mug’s that fit under the mini which you can see through the link but suffice to say the best options are limited (although there are some) in the insulated department. If you are getting a Mini brewer for yourself or as a gift keep in mind their size truly is small and don’t pair the gift with a large travel mug as they are not complimentary. Make sure to look at the store here in the 8-ounce travel mug section and the 10 ounce travel mug section this is where you’ll find the smallest insulated mugs with lids. You should also try to find something that is designed to be more like an insulated coffee cup rather than a travel mug. The cup styles will be wider with a handle; they don’t typically fit in car cup holders. Because of the shape they tend to be shorter even with the extra double-walled insulation. The best fit mugs however will be those that are insulated coffee cups. In many cases ceramic cups with a lid and silicone sleeve around the exterior will be shorter than double walled tumblers and there will be more options for fit. For instance the 8-oz Keep Cups will easily fit under the Mini since it’s only 4 inches tall. Thanks for reading and please share this post if you found it helpful!